How a pure devotee "blessed" God with long life ! Periyalvar (3055BC) is one of the alvars and is considered to be an incarnation of Garuda, the eagle-carrier of Lord Visnu. He was born in Tamil Nadu in the Pandiyan Kingdom with the present Madurai city as the capital, in a small town called Srivilliputhur. He was a great devotee of Kannan (Lord Krishna ) and spent his entire life serving Sri Vada-badhra-sayi as chief priest and making garlands daily. The raja-gopuram of this temple is the emblem of the Government of Tamil Nadu. Once, the Pandiya King Vallabha Devan wanted to know the Supreme Truth and the actual meaning of Vedas. He invited all the Vedic scholars to come and explain the teachings of Vedas. Lord Narayana appeared in the dream of Visnu Cittar (Periyalvar’s earlier name) and ordered him to go to the assembly to clear the doubts of the king. Visnu Cittar was perplexed as he had never studied Vedas and appealed to the Lord. But the Lord assured him not to worry. In the assembly, to his great surprise, Vedic hymns, Vedantasutras and their explanations flowed out of Visnu Cittar’s mouth like a river running down the mountain slopes. Quoting from the revealed scriptures, he thoroughly established Lord Narayana as the Absolute Truth (satyam param dhimahi), the protector and provider of all the living beings. The jubilant king honored Visnu Cittar by offering prostrated obeisances and giving him the title Bhaööar Piran (chief of all priests and panditas). Placing Visnu Cittar on the royal elephant, the king sent him back home with several gifts. Visnu Cittar’s “blessings” upon the Lord offer interesting insights. Pallandu means “countless earthly years,” but he realized that this was a temporary world and is going to end one day. So he extended his blessings by adding another pallandu, “countless heavenly years” (life on the heavenly planets is thousands of times greater than life on earth). But Visnu Cittar knew that even the heavenly planets are temporary and would perish one day. So he added pallayirathandu, “countless Brahma’s years.” But the scriptures tell that even Lord Brahma has to die one day, although after many billions of years. So how could he award such a perishable life to the Lord, Visnu Cittar wondered. So he compounded it by adding palakodinurayiram, “countless Brahma’s years of countless Brahmas.” Since Visnu Cittar blessed the Lord to live eternally assuming himself to be a protector of the Lord, he was called Periyalvar (periya means “big” or “great”). In the subsequent verses of the song that he composed, Periyalvar even went on to bless Sri Devi, then the Lord’s names, pastimes, paraphernalia and entourage with long lives. And in the next ten verses, he called out for all those interested in the well-being of the Lord to come and join him in singing the glories of the Lord and conferring Him with long life! These verses became famous as Thirup-pallandu and are chanted even today in all the Sri Vaisnava temples early in the morning while waking up the Lord. 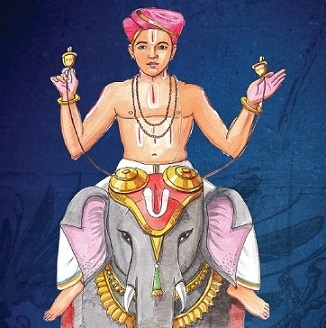 Starting from Thiruppallandu his 373 songs are called as the Periya Thirumozhi (“great divine renditions”) and form the first 373 verses of the 4000 verses of Nalayira-divyaprabandham. Nalayira-divyaprabandham is a collection of 4,000 (nalayiram) verses composed before 8th century AD, by the 12 alvars. The pastimes between the Lord and His devotee are very sweet—both try to serve and glorify each other. The Lord is bhakta-vatsala (the lover of His devotees) and bhava-grahi janardana (one who takes the essence of one’s devotional mentality). Narayana Srinivasa Dasa stays in Secunderabad and is a disciple of His Holiness Bhakti Vikasa Swami. He was born in Srivilliputhur, the birthplace of Periyalvar.